It's after school Cooking Camp at Nana's again! Look at the pretty tea time tray for Cissy. This is the pretty teacup that Cissy picked out for today. It's one that my daughter (Cissy's mom) gave to me. it goes with Cissy's shirt and the cookies! Good choice, Cissy! 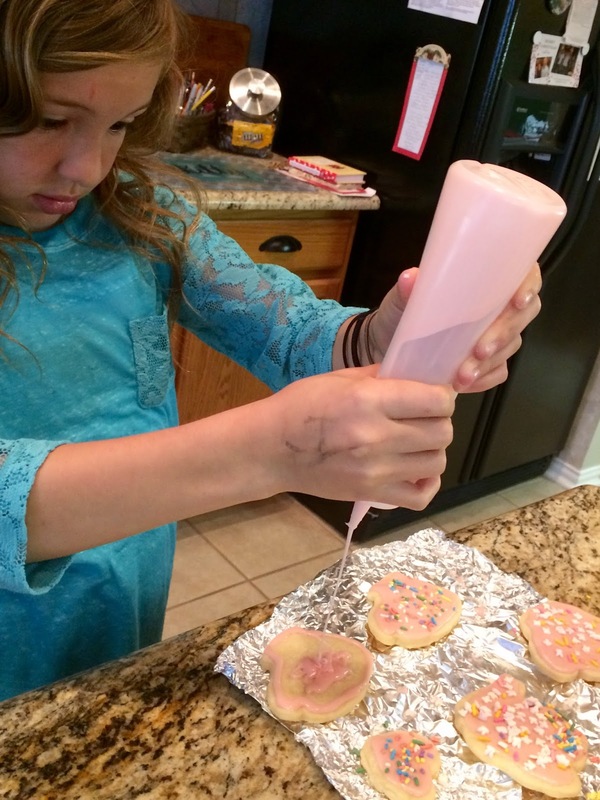 In this picture, Cissy has outlined the cookie first and is now flooding the center with icing. Cissy is doing more flooding and then decorating with sprinkles that she chose. I said to her, "Cissy, you're doing so well. You're my top student!" Cissy replied, "Uh Nana, I'm you're only student!" Oh, funny girl! This recipe always turns out great! It came from a local grocery store, and I hope you give it a try. Place the butter and sugaar in large bowl of electric mixer and beat until light in color. Add egg, milk, and vanilla and beat to combine. Put mixer on low speed, gradually add flour mixture, and beat until mixture pulls away from the side of the bowl. Divide the dough in half, wrap in waxed paper, and refrigerate for 2 hours. Sprinkle the surface where you will roll out the dough, with powdered sugar. Remove 1 wrapped pack of dough from the refrigerator at a time. Sprinkle rolling pin with powdered sugar, and roll out dough to 1/4" thick. Move the dough around and check underneath frequently to make sure it isn't sticking. If dough has warmed during rolling, place a cold cookie sheet on top for 10 minutes to chill. Cut into desired shapes, place at least 1" apart on greased cookie sheet, parchment covered baking sheets, or silicone baking mats. Bake for 7-9 minutes or until cookies are just beginning to brown around the edges, rotating cookie sheet halfway through baking time. Let sit on baking sheet for 2 minutes after removal from the oven and then move to complete cooling on wire rack. Serve as is or ice as desired. Store in airtight container for up to 1 week. Mix together: 1 and 1/2 cups powdered sugar, 1/2 teaspoon vanilla or almond flavoring, 1 teaspoon light corn syrup, 2 and 1/2 tablespoons room temperature water, pinch of salt. If icing is too thick, add a little water. If too thin, add a little powdered sugar. Add gel or liquid food coloring. Use squeeze bottle for easy decorating, outlining your design first, and then flooding the center and spreading with a knife. Cissy is a natural...love her concentration! I'll definitely try the cookie and icing recipes! Thank you! How very sweet! Missing my own granddaughters now, but we will be home soon! Such a lovely tea tray. Good job Cissy! I bet those cookies taste as good as they look! What fun for you and Cissy! Oh my goodness, I wanna join Nana's Cooking Class! You both made pretty teapot cookies, does it get any better? Oh yes, it does - you get to have a lovely teatime after - with the prettiest pink flowers, beautiful teacup - and the sweetest teatime partner/student/love ever! She has the kindest eyes. What pretty cookies and Cissy looks right at home baking cookies with her Nana. What fun you two must have baking and sipping tea together. Have a lovely day, my lovely friend. 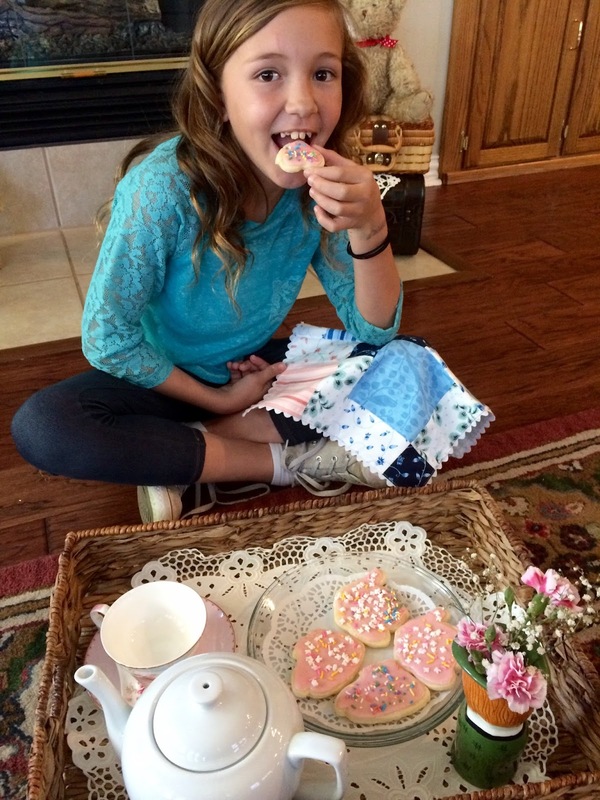 Cissy did a a wonderful job with the sugar cookies--they're perfect for tea time! I have some teapot and teacup cookie cutters, but never actually used them for baking...one is currently hanging from my chandelier. HA! Kitty, those cookies look so delicious! What a pretty pink! 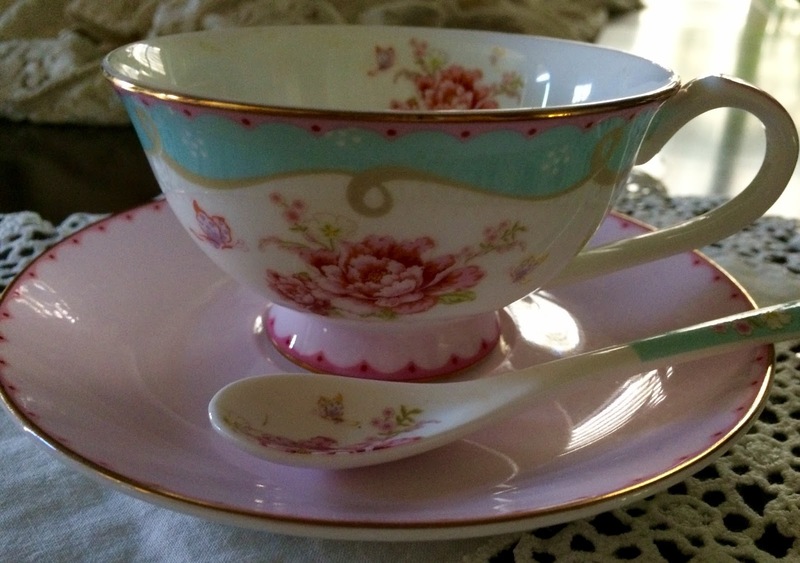 Your teacup, saucer, and matching spoon are so feminine and sweet! 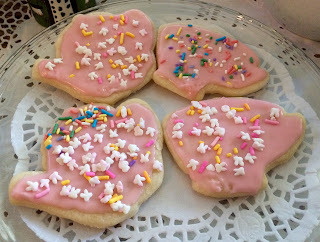 I love sugar cookies, as they were the only ones my Mom would make at Christmas. I'll have to compare her recipe with yours. If different, I'll make them both & have a taste-off!!! p.s. I have those same tea cup & tea pot cookie cutters!!! Hi Kitty, looks like lots of fun at your cooking camp. Cissy is so talented and did a beautiful job decorating the sugar cookies. Love all your photos. The teacup Cissy picked for the day is beautiful!! 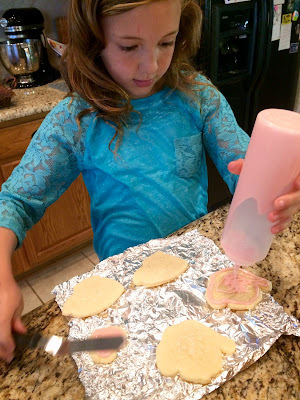 Thank you for sharing your sugar cookie recipe. It is one of my favorites. I iced sugar cookies with royal icing for the first time last week. Yes...for the first time!!!!!!! It always intimidated me, so I shied away from it. Turns out it's not nearly as scary as I'd worked it up in my mind to think! Tell Cosby hers turned out great...better than mine!!! 😀 Have a great week! Oh those cookies look yummy! I do love a good sugar cookie with a cup of tea or coffee. Cissy is going to be a great baker and decorator. Starting young is the key. Her cookies are adorable. Perfect for both of you to have a teapot cookie cutter! Beautiful cookies-and they match Cissy and our springlike weather.Love that tea cup too. Enjoy your grandkids time, Kitty! She is so adorable, what could be more fun than an afternoon and grandma's making [and eating!] teapot sugar cookies! I see you are at it again Kitty. Baking some delightful treats and spending fun times being a Nana. Love the pretty teacup. So sweet, Kitty. I love that Cissy gets to pick out her own tea cup. She is a doll! Enjoy your weekend. I am telling you - this girl is well on her way to become a Pastry Chef! So cute and her tray looks lovely. Thanks for sharing. Another fun tea party! Those sugar cookies look delectable. Cissy looks as if she had the best time and I love the teacup she chose. Hi Kitty, your cookies look and sound so good! Thanks for sharing the recipe to make them at C&C with J&J. Hope you have a nice week. Top student for sure!! And what a cute one she is. Thanks for sharing with SYC. Cissy is adorable! I love that you get to spend such quality time with your grandchildren. These little sugar tea pot cookies are just perfect for a tea party. Thanks so much for sharing your awesome recipe with us at Full Plate Thursday. Hope you are having a great day and come back to see us real soon!